Ekte Lykke: Olympic hat madness! 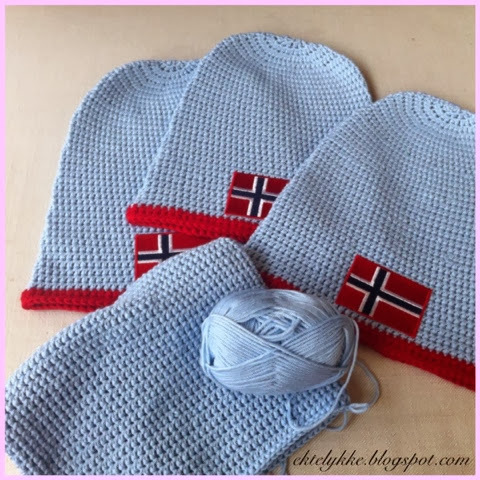 My previous post was in Norwegian, and included a pattern for my version of the incredibly popular Norwegian Olympic Hat. Since I posted this, I've had a few requests via e-mail and Instagram for an English version of this pattern, so now I've tried, to the best of my ability, to translate this into English. You'll find the pattern at the end of this post. 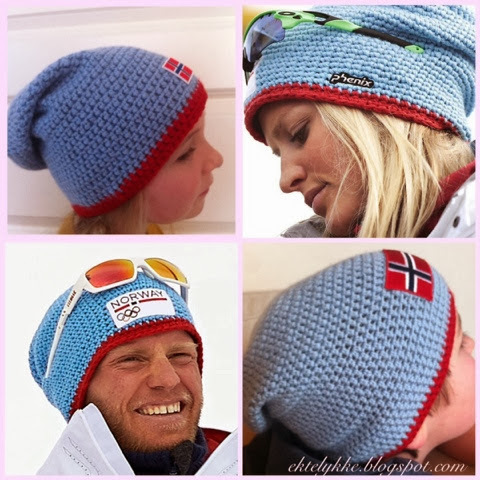 The last couple of weeks, Norway has been hit by a massive "hat-madness" involving some cute, crocheted, light blue "Smurf-hats" worn by the Norwegian athlets during the Winter Olympics. The Norwegian athlets` Olympic uniforms were from the Japanese sportsbrand Phenix, and personally I think they looked great! Fresh, simple, sporty and very Scandinavian looking. Very fitting for our great athets. 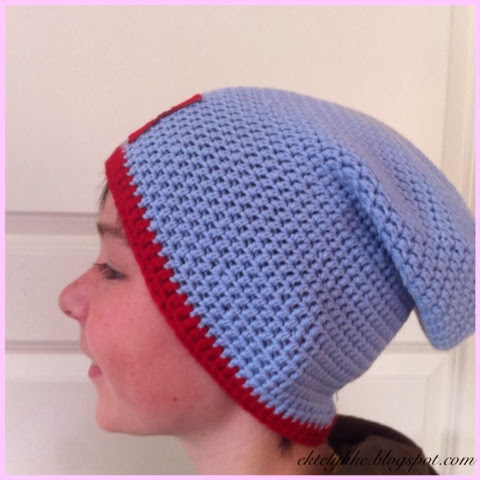 But the "cherry on the top" was without a doubt the light blue crochet hat! This hat was sold by one retailer only in Oslo, Norway, and the 10 000 hats they had in stock were sold out so fast that the Olympics had bearly started when the hat-frenzy began. As soon as the first Norwegian medal was a fact, and the athlets started to appear on the podium and on TV all wearing these hats, my kids started asking for hats of their own. So, after a few hours of nagging, I put away all my other WIPs and started making my first hat. It worked out pretty well, and my son walked proudly to school the next day wearing his new hat. It was an immediate hit at school, so he came home with orders from his friends. By now there are lots of patterns for this popular hat in "Blogland" right now, since it is a fearly simple pattern to figure out from looking at the photos of the orignal. I have, however, been faithful to my own version, which I find works well and has a nice fit. Here is the pattern to my version of the Olympic hat. I'm not used to writing patterns, and this is my first ever pattern in English, so if you try it and find something confusing og wrong, please let me know so I can correct it! I'd appreciate any feedback on this! Size: The pattern fits the size of most children (from age 6 ) and women. If you want to make the hat smaller or bigger, it is easy to adjust the width by reducing or adding the number of stich increases. Row 1: Make a «Magic Ring» and crochet 8 htr in the ring, or chain 8 and make a ring with a slip stich (sl st) in the first chain. Crochet 8 htr in the ring. Repeat from * to * till the end of the row. Row 6: * 3 htr, 2 htr in the next htr . You will now have 72htr. If you want a bigger hat, you can do another row with increases now, if not you just continue with 1 htr in every htr until you reach the length you prefer. Try the hat on as you go, to make sure the fit is OK. If it is too wide or too small, you can easily increase or decrease to get a perfect fit. It is supposed to be snug around you head, but with a baggy top. When you reach you preferred length, fasten off with a sl st.
Red edging: I used 3 threads of yarn on the edging to make it a little firmer than the rest of the hat. Fasten off with a sl st and weave in all the ends. Size: The pattern fits the size of most children (from age 6 ) and women. If you want to make the hat smaller or bigger, it is easy to adjust the width by reducing or adding the number if stich increases. 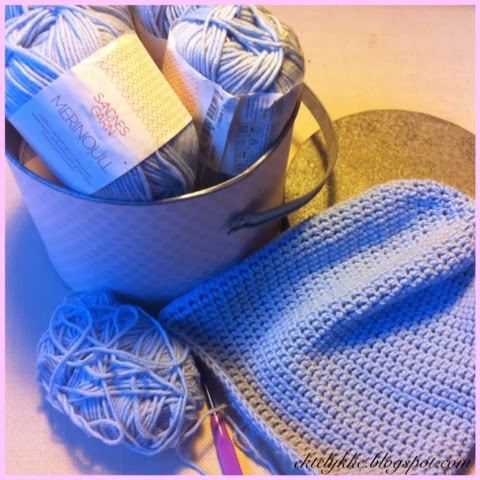 Row 1: Make a «Magic Ring» and crochet 8 hdc in the ring, or chain 8 and make a ring with a slip stich (sl st) in the first chain. Crochet 8 hdc in the ring. Row 6: * 3 hdc, 2 hdc in the next hdc . You will now have 72 hdc. If you want a bigger hat, you can do another row with increases now, if not you just continue with 1 hdc in every hdc until you reach the length you prefer.